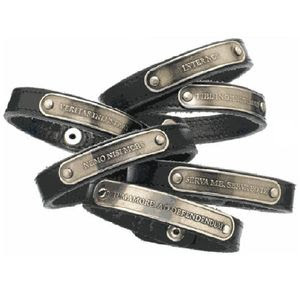 Marc By Marc Jacobs Leather Latin Bracelet (Nemo Nisimors) Marc by Marc Jacobs Latin Phrase Bracelet Leather with metal plaque inscription "Nemo Nisi Mors - No one but death shall part us" New 100% Authentic. Small length: 8.25" button to button: 7"; Large length: 9" button to button: 7.75". Marc By Marc Jacobs Leather Latin Bracelet (Tibi, In Omne Tempus) Marc by Marc Jacobs Latin Phrase Bracelet Leather with metal plaque inscription "Tibi, In Omne Tempus - For you, forever" New 100% Authentic. Small length: 8.25" button to button: 7"; Large length: 9" button to button: 7.75".